The star of the new Disney-Marvel movie Big Hero 6 is a poofy robot named Baymax who can assess your health with a laser-enabled two-second full-body scan. He also might soon be a reality. Baymax and other robots in the film were inspired by eight actual robots, some of which were designed and built in labs at MIT, Carnegie Mellon, and DARPA. In their quest to make a near-future for Big Hero 6 that was as realistic as possible, including building a digital city that's a mashup of San Francisco and Tokyo, directors Don Hall and Chris Williams were adamant about using actual technology in the film. Their research took them to several robotics labs on the East Coast, visiting scientists at Carnegie Mellon, Harvard, and MIT, as well as in Tokyo, where they were introduced to the next robot generation. Although the plan was to incorporate ideas from the bleeding edge of robotics research, in many instances the technology ended up becoming more mainstream by the time the film was finished, says Hall. "We tried to look five to ten years down the road—and already that seems dated." Throughout the filmmaking process, the directors and animators continued to reference their real-life inspirations, making sure that they weren't inventing technology that was too far afield. "It has to be grounded in a believable world," says Hall. That's because the characters themselves in Big Hero 6 don't use magic or fantastical powers; they are really only armed with science to save the day. "Their superpowers are their intelligence, and that's a great message," says producer Roy Conli. "It's really a celebration of the nerd." The Soft Machine Labs at Carnegie Mellon provided much of the inspiration for Baymax's form, where robots are made from tensile, inflatable materials (much like the positive-pressure suits worn by humans in hazardous conditions). 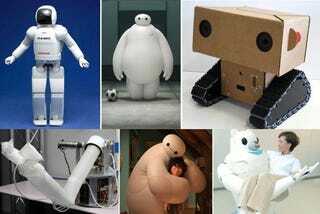 Carnegie Mellon's soft robotics expert Chris Atkeson has even put together a guide for how to build your own Baymax. Caregiving robots are widely used in Japan, where they've been developed to care for the quickly aging population. One model, RIBA-II (Robot for Interactive Body Assistance), has a strong torso—much like Baymax—which can help lift patients out of wheelchairs or into beds. Others can monitor basic vital signs, which Baymax does constantly, much to Hiro's annoyance. The smart, swarming microbots invented by Hiro were inspired by a drone swarm video the filmmakers found on YouTube. These "nano quadrotors" developed by the University of Pennsylvania's GRASP Lab can fly in tight, synchronized formation with a preciseness that's almost alarming. Much of Baymax's demeanor (and cuteness) comes from a cardboard robot named Boxie which was developed by MIT's Media Lab in 2011 as a kind of mobile reporter. Filmmakers loved the playful, fun aspect of Boxie, and it's easy to see how those round eyes made their way into Baymax's expression. The flashy in-home fabrication system which Hiro uses to fabricate Baymax's suit is a next-generation version of the popular 3D printer, which the directors encountered during a visit to the maker utopia TechShop in San Francisco. The TALOS bionic exoskeleton, also known as the "Iron Man suit," is currently being developed by the Army as a smart armor soldiers can wear in combat. Not only does it help protect their bodies from attack, the suits can help soldiers lift heavy objects and walk far distances. Unlike the suits that the characters wear in the movie, they can't fly... yet. Filmmakers visited the showroom in Tokyo to meet Asimo, the robot developed by Honda. Asimo served as a kind of baseline for how "normal" Baymax should feel when out interacting with humans. Plus, he has a nice robot personality. "He's so charming," says Hall. Here's the best example of an almost-possible technology discovered by the directors during the early stages of the film which managed to be developed into an actual prototype last year. A technique by DARPA called Targeted Muscle Re-innveration (TMR) for Advanced Prosthetic Control reads brain signals being transmitted through the nerves to control prosthetics. The way Hiro controls his microbots is more like telekinesis—which we'll probably see from DARPA soon.